The Saskatchewan Music Festival Association (SMFA) has a proud heritage, providing a platform for music festival performances for students across the province. The SMFA Provincial Office hires approximately 170 professional musicians each year to adjudicate the 47 district festivals. This workshop explores the philosophy behind music festival adjudicating as well as plenty of practical advice about constructive adjudication, assigning marks and awarding scholarships, as well as working with local festival committees. The material presented is helpful to anyone considering working as a music festival adjudicator in the future and may also be of interest to those already working in the field but looking for some new ideas or a refresher course. There is plenty of time for questions and specific challenges of adjudicating are addressed. 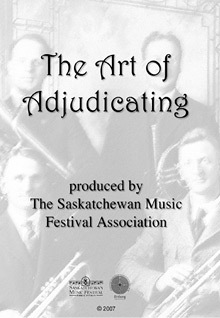 A professional adjudicator training DVD, The Art of Adjudicating, is available for adjudicators working in our province. The video covers the philosophy behind our festivals, the rules and regulations, the marking guidelines as well as possible scenarios in which adjudicators find themselves. It is useful to those individuals who are considering adjudicating for the first time, as well as pointers for experienced adjudicators. Our hope is that it will help adjudicators with those questions that arise on so many occasions and will provide them with a protocol for fair judging which will be of benefit to all festival participants. To purchase your copy ($15/copy) of The Art of Adjudicating, please contact us for a copy.